One of the greatest summer activities is watching an al fresco screening of a fun summer movie. Whether you’re heading to Jaws, Weekend at Bernie’s or Wet Hot American Summer, plan ahead by preparing an epic spread of delicious movie-watching snacks. Here, some of our favorite snacks to make for an outdoor movie picnic. These salty-sweet bars are studded with mini pretzels and gooey chocolate chips. This is chef Katie Button’s sweet and savory take on the classic snack, Cracker Jack. True to its name, this guacamole takes less than two minutes to make (and eat). 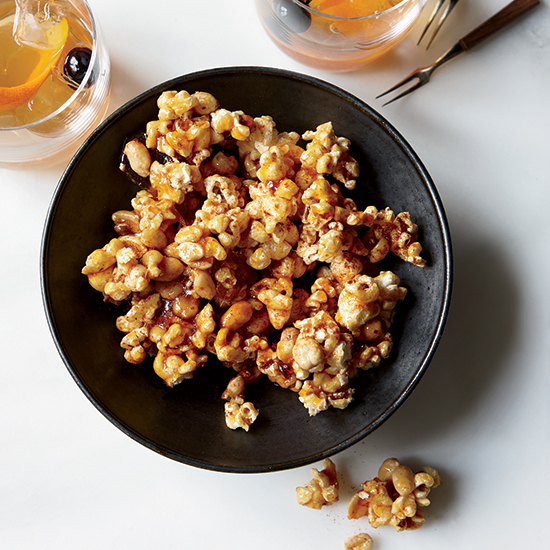 Salty, sweet and a little spicy, this kettle corn is crazy satisfying. Barbecue rub isn’t just for ribs and chops. It’s delicious on crunchy roasted chickpeas. Sweet potatoes add a hint of sweetness to regular hummus. The only way to make crispy fried cheese better is by topping it with thinly sliced soppressata. These porcupine cookies have pretzel-stick “quills” and M&M polka dots. Pimento cheese—the simple combination of grated cheddar cheese with mayonnaise and pimientos—is a Southern staple best served on crackers or vegetables. Eat these slightly sweet, chewy, dark pretzel sticks plain or dipped in mustard or ranch dressing. This fresh cheese spread is flavored with herbs, cider vinegar and walnut oil. These crispy, crunchy, nutty and chewy mounds with just the right amount of salt are incredibly complex—and dangerously good.